The Lib Dems are running a huge campaign to tackle the stigma around talking about Mental Health issues, where people suffering from it feel they cannot talk about it. Oddly I have been happy to talk about my mental health issues to anyone who wants to listen. But sometimes it feels as if there aren’t that many people that want to hear about it. There was the campaign day from Mind on 5th February about taking the Time To Talk, which I was delighted to take part in. And the Lib Dems want the NHS to handle Mental Health in the same way as Physical Health and have put this as a red line on the front page of our manifesto. What I’ve been struck by is that Mental and Physical Health shouldn’t just be handled the same, they are the same. The effects are the same. The impacts on people suffering from them are the same. Having seen so many people go through cancer that are close to me and going through mental health issues myself, I am struck by the difference in attitudes towards them, despite the similarities. When you have a physical illness, if you’re physically fit, healthy and strong, you still end up feeling tired, sapped of energy and struggle to do what you did before. When this goes on for a prolonged period of time, you can feel emotionally exhausted as well. When you have a mental illness, if you’re mentally strong, have an active mind and are capable, you still end up feeling tired, sapped of energy and struggle to do what you did before. When this goes on for a prolonged period of time, you can feel emotionally and physically exhausted. The treatment for cancer can leave you feeling in a lot of pain, sapping your strength further, sometime even further than the illness did. That pain saps your energy more. It can leave you irritable, grumpy, short tempered, even irrationally angry. Sometimes the pain medications cannot take the pain away. Talking therapies for mental health can leave you in a lot of emotional pain, uncorking things you have buried to keep the pain away, sapping your reserves further, sometimes further than if you did not confront the issues and leave them bottled inside, and certainly more than if you stay in bed, safe and secure. That pain saps your energy more. It can leave you irritable, grumpy, short tempered and irrationally angry. I don’t have any direct experience of mental health medicines, but from what I’ve seen of from friends and heard from my therapist, they numb you to take the pain away. Sometimes you are just suppressing the pain, perhaps just delaying it until you’re better able to cope with it. For others, the medications are like insulin for diabetes, addressing a persistent underlying physiological problem. Many cancer patients have to go through their chemotherapy and then continue work as best as they can, because they can’t afford not to work. They muddle through each day as best at they can, using an enormous effort to get through it. At the end of the day, they feel exhausted and collapse and can’t do anything more active than lifting the remote control. Many mental health patients go through their days, continuing to work because they can’t afford not to. They put on a brave face, muddle through and nobody can tell that there is anything wrong with them. At the end of the day, they feel exhausted and collapse and can’t do anything more active than lifting the remote control. When you’re physically unwell, even with a cold, you sometimes don’t want to see anyone else. You don’t want them to see you unwell. You don’t want to make the effort to put on a brave face. Putting on the brave face takes energy you need to fight your illness. If someone asks you how you are, you want to be free to NOT say, “I’m fine”, but say “I’m feeling crap.”. With chemotherapy or many other illnesses, the illness or the treatment can make you feel so sick, so horrible that you cannot get out of bed, sometimes for long periods of time. With mental illness, you can feel so sick, so horrible that you cannot get out of bed, often for long periods of time. When you’re physically unwell you need people around you to do all the daily stuff, cook, clean, take the kids to school, make sure you take your meds, yes. But you also need people around to talk to, so you can share you’re feelings. Or to talk to you about something other than your illness to remind you that you’re not defined by your cancer. You need people to demonstrate that they care to make you feel better about the awful time you’re going through. When you’re mentally unwell – well you get the picture by now. You need people around you to share how you’re feeling with, to talk to, to remind you that you’re not defined by your mental illness. You need people to demonstrate that they care to make you feel better about the awful time you’re going through. I’ve heard said a couple of times recently, that people with mental illness are hard to live with. Yes, yes we are. 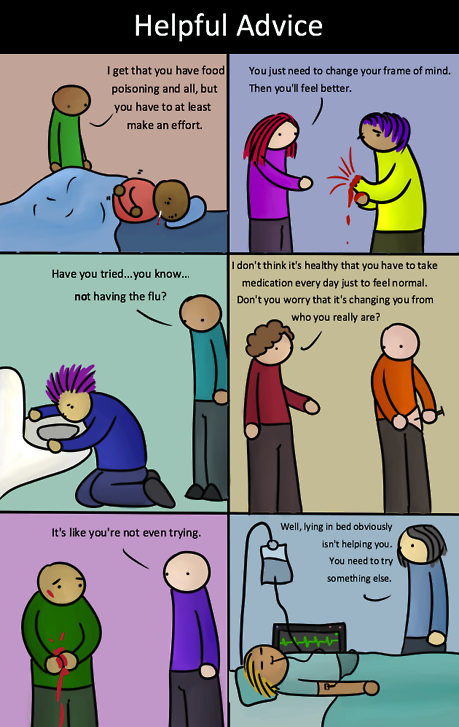 But I’ll let you into a little secret, people with physical illnesses are hard to live with as well. They can be tired and don’t help out much, they can be grumpy and irritable, they can be unclear about their needs but still be demanding. They sometimes can’t go out much but need you to still be around to help them. They need a lot of attention for themselves on top of the extras you have to do to keep things going. It can be hard but it can be immensely rewarding and we do it because we love them. Cancer used to be a death sentence and many still react to a diagnosis as if it still is. Thankfully our treatments for cancer have so hugely improved that now more than half of cancer patients now survive for more than a decade. Mental illness can be a life sentence for many, though not all. Treating them as if their illness is not as serious as a physical illness add to the stigma and effectively puts them in solitary confinement for the period of their sentence. It is not just the stigma of talking about mental illness that we need to tackle. We need to tackle the disgusting, unhelpful perception that there is anything different at all between mental illness and physical illness. People who have mental health issues are not weak, lazy, needy, or not making an effort to get better. They are ill and their illness is having the same effects on them that a physical illness has. Sometimes, like physical illnesses, those effects may have been taking their toll for a long, long time before the cause is diagnosed. Those effects (otherwise known as symptoms of the illness) do not magically start on the day of diagnosis, or on the day of breakdown. They may well have gone dismissed for a long time, like that persistent cough that will not go away, that is in fact lung cancer. So let’s all just agree we’ll stop calling them mental illness and physical illness and just call them by what they are: illness. We can then perhaps start to treat everyone who is ill with dignity. Perhaps then, people with all forms of illness, not just the visible forms, will be able to talk freely about what they are going through and not feel any stigma about talking about their illness.